I have helped over 400 seminar agents with their mailings over the past year and I still get this question. 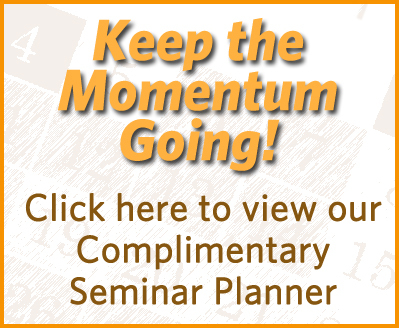 The vast majority of agents are using meals to attract potential customers to their seminars. There are still some agents, however, who do not feed and a few industry experts who do not recommend using meals. In this article I will tell you what our observations are on this issue and our opinion of what you should do based on our experience with thousands of seminar mailings. Occasionally I have agents call me just after a seminar where they paid a $2,500 food bill and were only able to make 3 appointments. The standard comment is “These people were only there for the food”. Then, as I listen patiently, the agent will launch into a long and emotional explanation about how the industry has reached a saturation point. Their logic is basically that there are so many agents out there mailing to the same people that virtually all the attendees are just coming for the free food and are not at all interested in what the agent has to say. The conclusion that these agents arrive at is that they should stop feeding people and then only those who are truly interested in listening to the agent will attend the seminar. Then, these people, who only came to hear the agent’s message, will be anxious to make an appointment and hand over their money to the agent. Here is the problem with that logic. 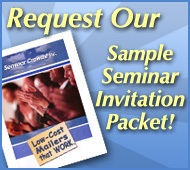 Our statistics show that seminar mailings, where a meal is provided, result in an average 1.0% response rate. Seminars held at the right restaurant can result in response rates over 2%, or even more than 3%. Mailings, where no meal is offered, result in an average 0.25% response rate. When you include the cost of meals you invariably end up with a LOWER cost per person in the room when you offer a meal. It may seem counterintuitive but in most cases the more you pay for the meal the lower your cost per person in the room. For example; let’s say you mail 7,500 pieces for $2,500.00, you have 75 people in attendance and you pay $20.00 per meal. You have paid $1,500.00 for your meals and a total of $4,000.00 for your meals and mailing. Your cost per person in the room is $4,000.00 divided by 75, or $53.00. The non-feeder sends out the same 7,500 mailing which costs him $2,500.00 and he gets .25 % or 18 people in the room. His cost is $2,500 divided by 18 or $138.00 per person in the room. This phenomenon will occur almost every time in mature markets where there is a great deal of competition. In many cases the discrepancy will be even more pronounced. In some cases it will not be as extreme. Rural areas and markets that have less competition for seminars will obviously allow non-feeders more of a possibility to operate economically. Some agents believe that the appointment ratio and ultimate closing ratio will be higher at non-feeding seminars because those people who “just came for the food” will never buy from you. Our observation is that the appointment ratio and closing ratio have no direct correlation to whether you feed or don’t feed. The only factor involved in appointment ratios and closing ratios is the ability of the agent. This is confirmed over and over again by the top agents in the business who consistently get 80% appointment ratios and higher at seminars where they have purchased meals for their attendees, even at very expensive restaurants. Think about it this way, if they like you and trust you they will make an appointment with you, whether you feed them is not relevant. If they never meet you how can they know if they like you? 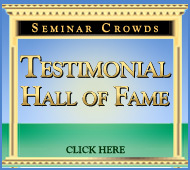 You have to attract them to your seminar so you can have the opportunity to get the appointment. Our conclusion on this issue is very clear. You will see more people if you feed and you’re marketing dollars will be used more efficiently. You will make more appointments if you see more people, and you will make more money if you have more appointments. Assuming you have the right restaurant and are using an effective mailing system to bring in the attendees the next step is to improve your speaking skills and your closing skills. Call me anytime for tips on which trainers and boot camps are most highly appreciated by the most successful agents. As far as restaurant strategy goes ask your clients which restaurants they love the most and you will be able to create a list of the restaurants that will draw best for you. We can say unequivocally, after 3 years of experience with our mailing system, that the restaurant is the primary factor determining the response rate you will receive from your mailings. This is the most important decision you will make regarding your marketing strategy.